In my last post I introduced you guys to Healuxe Beauty, my upcoming online green beauty boutique. Since the grand opening of the site is a few months out, I thought I'd make a little time each Sunday to introduce you to one of the amazing lines that Healuxe will be carrying. 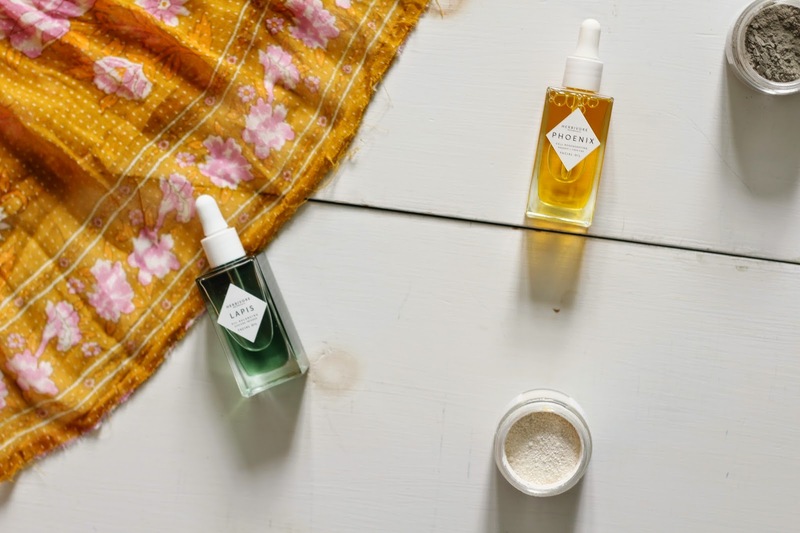 Today's spotlight is on a very special Seattle-based brand called Herbivore Botanicals, a brand that was actually started out of couple Julia and Alex's own kitchen. The brand places a strong emphasis on bringing consumers only 100% natural, safe, non-toxic and very effective products. They're made in small batches and each ingredient is carefully chosen to bring you the absolute best results. Speaking from experience, I can say that the products that Alex and Julia have created can truly bring some astounding results. Everything from their skincare and body care to bath and hair products are truly effective with carefully chosen (often rare) ingredients for each and every concern.Today I'm going to focus on just a few of these products, including two of their bestselling facial oils and face masks. I actually remember when I first read about Herbivore Botanicals some time ago, it was actually through a review on one of their facial oils. The review was a glowing one, which is about what you can expect from me today. The brand currently offers three oils for different skin types - Orchid for normal skin, Lapis for combination or oily, and Phoenix for dry, mature or sensitive skin. Depending on the season, I actually fit in the categories for all of these, so I started out by using Lapis during the day and Phoenix at night. Lapis contains a gorgeous natural blue color, coming from its ingredients of Blue Yarrow and Blue Tansy, both containing powerful anti-inflammatory and antibacterial properties that help to reduce redness and clarify your complexion. During the warmer months, my skin does tend to lean a bit more oily, so I have been loving this lightweight option during the day. The formula sinks in quickly, immediately soothing my skin and leaving it ready for a next step (usually just a bit of SPF these days). At night, I switch it up by applying the Phoenix oil, a more hydrating, thicker option containing such ingredients as Rosehip, CoQ10 and Sea Buckthorn Oil, to name a few. These ingredients (which I'll have to highlight in another post, because each and every one has such impressive properties to it) work to not only deeply hydrate your skin, but also to rejuvenate it on a cellular level. Using both of these gems together has, and I'm not exaggerating here, completely changed my skin for the better. So many mainstream facial oils contain a few great ingredients with a lot of unnecessary fillers and dyes, but Herbivore is very transparent in only filling their products with purely beneficial ingredients, and nothing else. My skin has become much more hydrated (I actually have had a few long-term dry patches that have literally disappeared), and I've even seen some acne scars markedly fade. The oils are truly great, and it makes me so honored to be able to sell them at Healuxe. They also each come in, not only full size, but a travel size roller as well! I would love to hear from you guys which of the two sizes you think you'd love try? Next up are two face masks from the brand (of which they have several), their Brighten and Activate masks. Both come in powder form, and can be combined with a few drops of water to create a paste (though I would imagine it could be combined with other things as well). I personally love the powder formulas that most natural masks come with, because you know that every single ingredient is beneficial to your skin, and not just fillers to make the mask a more liquid consistency (plus it lasts for awhile!). Their Activate mask contains ingredients such as Dead Sea Clay, Activated Bamboo Charcoal and Blue Yarrow, all perfect for a detoxifying and cleansing mask.This one is great for congested skin in need of a deep cleansing, while the Brighten mask is wonderful for when your skin needs a little boost of radiance. With ingredients such as Neroli, Rose Geranium Oil and Tourmaline Gemstone, I absolutely love this mask for days when my skin is looking a bit dull and in need of some serious brightening (it is, after all, a very well named mask). If you guys couldn't tell from my novel of a post, I absolutely am in love with this brand. Every ingredient they use in their products is so well thought out and carefully chosen to give the most effective results, and I truly appreciate how all natural and completely cruelty-free everything is. As I figure out my stock list, I would absolutely love to hear some feedback from you guys on what you'd love Healuxe to stock from the brand! I hope with this site to make it a really collaborative project, and all of your opinions mean the world to me! Right now I'm trying to decide between stocking the full size oils in the store versus whether you guys would love to buy the roller ball version? So if anyone has an opinion on that I'd truly love to hear! This brand is gorgeous from the inside out. I adore their minimal, luxe packaging and am eyeing the Lapis facial oil and their two masks. Which facial oil do you think has been the most beneficial for acne scars? I'm assuming the Phoenix one based on the ingredients.